Using appropriate equipment is of critical importance to a successful underwater hunter. I can't tell you how many times I've heard of equipment failures that resulted in a lost catch and, or a mutilated fish. I will cover the relevant equipment, pros and cons, what I use and why, in the following equipment sections. 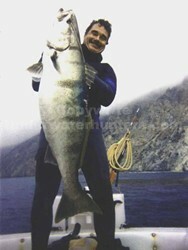 Only guns designed for large fish should be used for big game spearfishing and hunting. I am a firm believer that the only responsible approach to using lethal force is to employee only appropriate equipment for the task. The few remaining marine animals must be respected and not killed in vain. Perhaps the most misunderstood issue regarding high-powered, big game, underwater spearguns is the relationship between gun power and gun mass. Many spearguns tend to kick dramatically when fired. The problem is this radical recoil or kick during the transfer of power; this is where all the problems occur. The solution to this problem is taking control of this power transfer by increasing the mass of the platform or gun. Of course there is a number of ways to reduce the reactions of this power transfer but why take an aspirin when major surgery is needed. I believe in addressing the root of the problem not the symptom. The best way to put this relationship into perspective is to view a speargun as a launching platform and the shaft as the rocket. A more massive gun produces a more stable platform from which to launch. The best rule of thumb regarding this relationship is more mass is better. Harry Davis and Terry Maas were among the first to embrace this concept when they built unusually heavy guns back in the early 80’s. They reaped major benefits from their efforts. The result of properly weighted spearguns is exponentially more stability and performance. This extra stability dramatically translates into more gun power and accuracy. The correct amount of gun mass provides a cleaner power transfer from the gun rubbers to the shaft and reduces most, if not all of the negative side effect associated with overpowered under weighted spearguns. Simply put, add mass to your speargun if there are any problems with accuracy. Many fine spearguns are on the market today. They provide a wide range of length and power configurations for the most demanding underwater hunter. The type and size of game and the water conditions should be considered when choosing a gun. The clearer water and larger fish may require a longer and more powerful gun, while smaller fish and murky water may require a smaller gun configuration. I use a number of different gun configurations but for local hunting I use a, four rubber, modified Riffe Island model speargun with custom side stocks with added mass for stability. It weights around 14 lbs. slightly floats, point down, with the shaft in and consistently shoots straight and true over 20+ feet. The ultimate shooting line should be thin to limit drag friction on the shot, but strong to avoid braking during the ensuing battle. It should be cut or chafe resistant to resist damage against sharp bones and bottom structure. Many speargun manufacturers uses black monofilament shooting line on new guns. Monofilament may work around non coral rocks but not for me. Monofilament may be cut by sharp internal fish bones as well so I don’t use it ever. Some speargun manufactures use 7x19 strand coated 480 lb. stainless steel (more flexible than 7x7 SS) cable shooting line on new spearguns. I have experimented with Kevlar and stiff nylon line, but sharp bones and bottom can cut both. I use nylon coated 7x7 strand 480 lb. stainless-steel cable shooting line on all of my different big game hunting guns. I use a special swagger tool to squeeze set all my crimps. The problem with cable is it is to difficult cut. The advantages are stainless steel cable shooting line will sink so it is predictable when handled and it won’t fail around bone of bottom structure. I personally never use different shooting lines because my equipment is functioning with a minimum of problems and I like to keep it that way. The ultimate spear-tip is strong, fast and doesn’t cut fish flesh. I like 4-6" hardened breakaway stainless steel slip-tip. When shooting tuna I recommend offset side floppers on your slip-tip to insure a better hold on fish flesh after long shots in clear water. For many years I used 7X19 strand stainless steel cable, 5-6" long, 3/8" Diameter hardened stainless steel breakaway slip-tips. I have recently switch to a 1000+ lb. spectra breakaway line. I have found this to be far superior to the stainless steel cable in many ways. Spectra is stronger, faster and softer than stainless steel. Many fish are lost as a result of shaft whip or the breakaway line ripping large holes in fish flesh that allows the dart to fall out. The breakaway should be long enough to allow the shaft to come completely out of the fish after the tip has toggled. A good rule of thumb is the breakaway should be longer than the maximum thickness of the fish you are hunting. I prefer the cone (ice pick) cut tips to avoid possible hydrodynamic problems on long powerful shots. I have been using Spectra slip tips now for over a year and most fish I land have a very small entry and exit hole on both sides of the fish, which rarely if ever happened with stainless steel cable. I’m sold and will likely never go back to the standard stainless steel cable slip-tip. I am currently using a 5" ice pick with a 12" 1000+ lb. Spectra breakaway for the local White Sea Bass, Yellowtail, and small Tuna. Both reels and float-lines are very effective for big game fish. 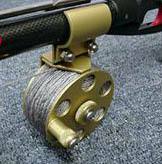 Reels are best used for smaller big game fish up to 100 lbs. Reels tend to be better for inshore reefs, kelp, and bottom hunting. Float-lines are more effective while open-water hunting. Most reels are set-up with about 150-250 ft. of line while some of the new reels have drags and breaks. I started using a float line about 25 years ago and have never gone back. Float lines have evolved into a very effective and reliable piece of spearfishing equipment. The new high-tech float lines are made of supper stretch material that can stretch three to one, they works like a long bungee (shock) cords. Ultimate 125’ vinyl bungee float-line (photo above) for fish up to 100+ lbs. As a result of being stripped by large White Sea Bass, I developed a new 125’ vinyl bungee float line. I, and many of my underwater hunting friends, have used this bungee type vinyl float line with a great deal of success for many years now while hunting for White Sea Bass. I use my 125’ bungee type float line with float attached when hunting open-water. I believe the float line configuration gives me the best of all possible terminal gear configurations. The utility float can be attached to your weight belt for quick access when needed. I have developed two sizes of utility floats. The largest float has around 80-90 lb. of buoyancy while the smaller float has approximately 40-50 lb. of buoyancy. My utility floats have been in use now for a number of years and have proven to be a valuable asset in a variety of underwater hunting situations. Look in the products area of this web site for more information on this product. When hunting in open-water for larger game fish, I use a hard float filled with high-density Divinycell foam attached to of my super 3-1 bungee float-line. These high-density Divinycell foam floats are designed to resist imploding at extreme depths when pulled down by a large fish. I use a high visibility flag at the end of the line for easy locating. There are some very nice hard floats on the market today. I like to put lots of pressure on a fish that is hit good to avoid deep kelp entanglement. In the event of a bad or long shots, sometimes the only option is to play it loose and hope the fish doesn't fall off before you can get to him and make the kill. Many times a fish will become entangled in the deep kelp. I carry a knife to extricate a kelp-entangled fish. I recommend a double-edged knife, the last thing you need on a deep dive is to be using the dull side to cut. Stringers are very handy when tying a fish off to your weight belt or float while untangling float-lines. 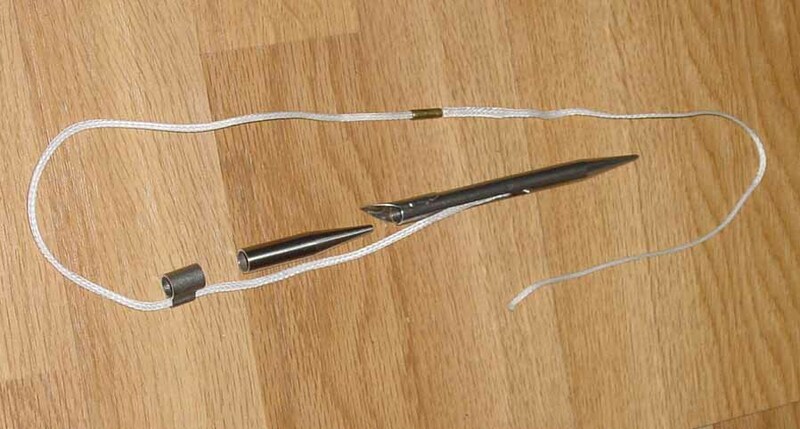 My stringers are 3/8"x 6-7" stainless shafts, try-cut point, with a 30" hard braid line, with a brass clip at the end. I role it up and keep it on my weight belt if needed. Look in the products area of this web site for more information on this product. Always be careful not to get caught in your lines, (especially if you are using steel cable) while working your fish out of the kelp, it is very easy to loose track of your line. This small mistake can cost you your life. I have a friend that carries a pair of wire cutters on his weight belt to avoid this problem.